Chapter 1. 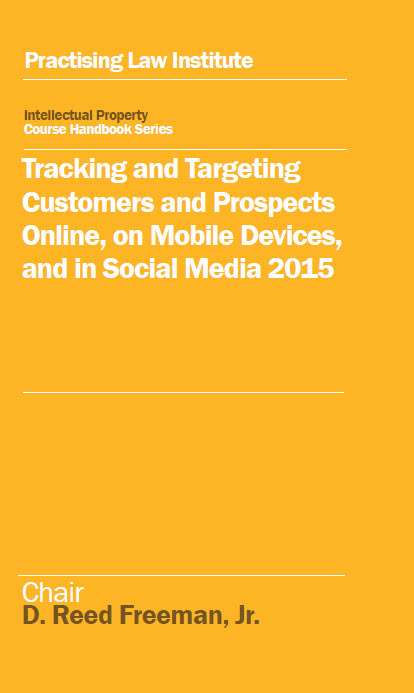 Tracking, Targeting and Analytics: How Does it Work? D. Reed Freeman, Jr. is a leading authority on privacy, cybersecurity, and online, mobile, and social media advertising and privacy law. Mr. Freeman serves as co-chair of the firm's Cybersecurity, Privacy and Communications Practice. Mr. Freeman has extensive experience defending clients in FTC and state consumer protection investigations and data breach responses. He also counsels clients on compliance with FTC and state trade regulation issues and advertising and privacy laws and self-regulatory codes. His clients include retailers, hospitality companies; financial institutions; software companies; hardware manufacturers; online, mobile, and social media publishers and advertisers; online, mobile, and social media application developers; data aggregators; advertising technology companies, advertising trade associations, industry coalitions, and seal providers; and social media-based advertising service companies. He also represents clients in false advertising disputes before the National Advertising Division of the Council of Better Business Bureaus, Inc. and the National Advertising Review Board. Mr. Freeman joined the firm following 16 years in private practice, where he handled a wide range of privacy, data security and advertising matters, counseled companies on FTC compliance, and served as lead counsel in numerous FTC and state consumer protection investigations and negotiations. Before joining private practice, Mr. Freeman worked in the FTC's Bureau of Consumer Protection as a staff attorney, and as chief privacy officer and vice president for legislative and regulatory affairs for Claria Corporation, an online advertising software company. Mr. Freeman has been called a Regulatory & Compliance Trailblazer by The National Law Journal, and is consistently recognized by Chambers & Partners (Band 1), Legal 500, Best Lawyers in America, Washington DC Super Lawyers and Washingtonian magazine. He is a member of the International Association of Privacy Professionals' Training Advisory Board and the Board of Editors for the new Cybersecurity Law & Strategy. Mr. Freeman is a member of the International Association of Privacy Professionals' Training Advisory Board and is on the Board of Editors for the new Cybersecurity Law & Strategy. He is the co-author of CCH's Advertising Law Guide and Privacy Law for Marketers, and previously served as an adjunct professor of privacy and advertising law at George Mason School of Law. He is a fellow of the Ponemon Institute, an organization dedicated to independent research that advances responsible information, privacy and security management practices in business and government. He previously served as a member of the Department of Homeland Security's Data Privacy and Integrity Advisory Committee.